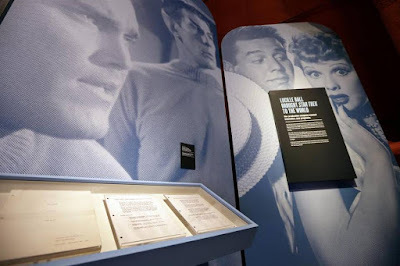 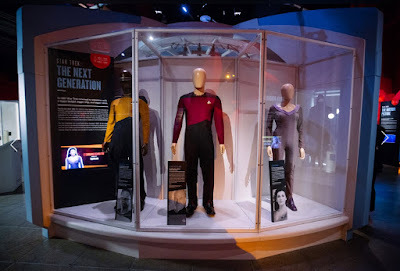 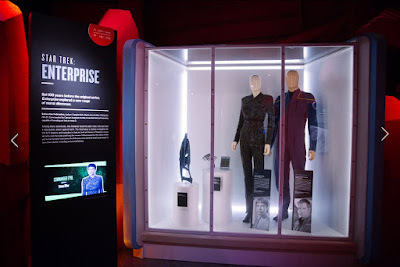 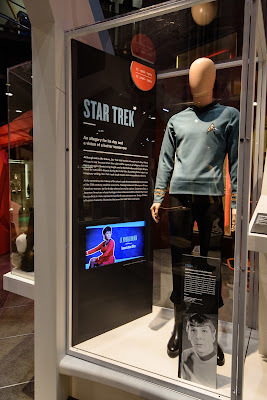 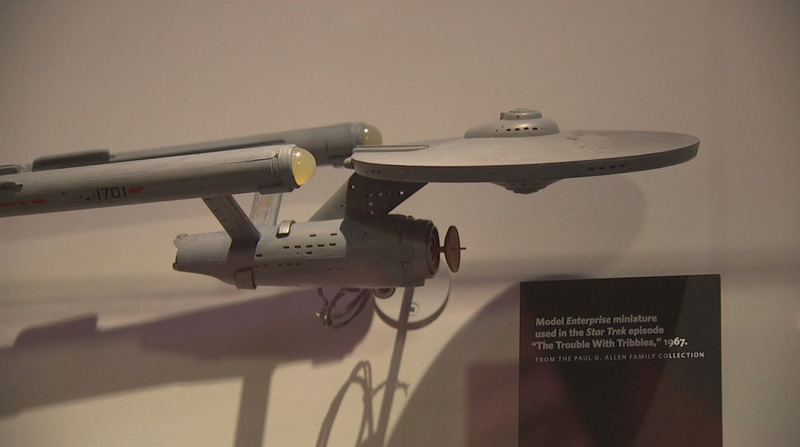 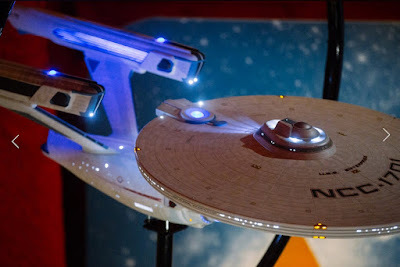 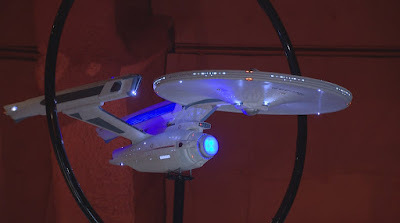 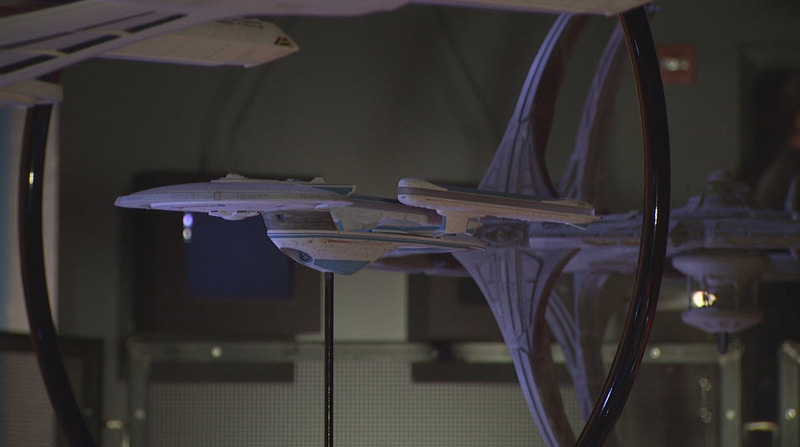 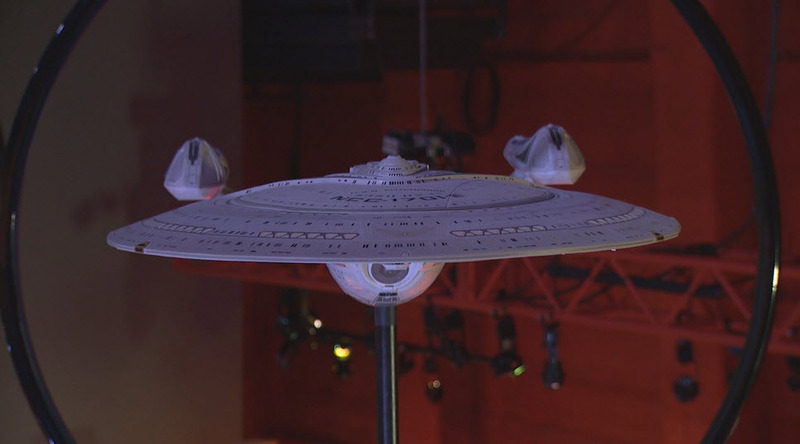 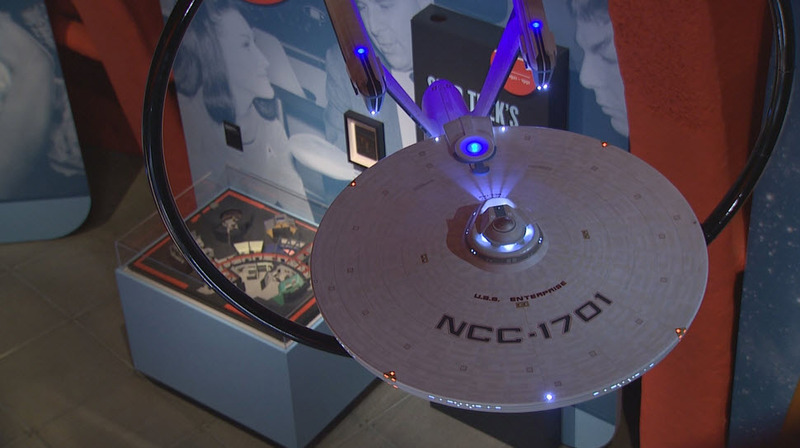 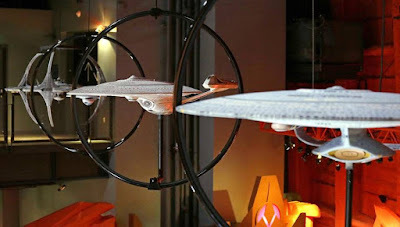 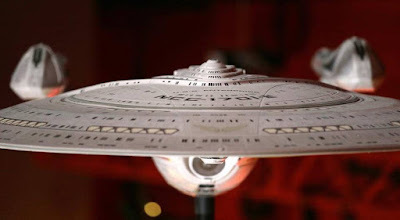 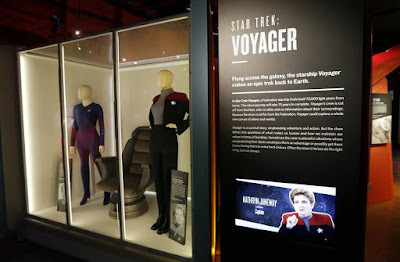 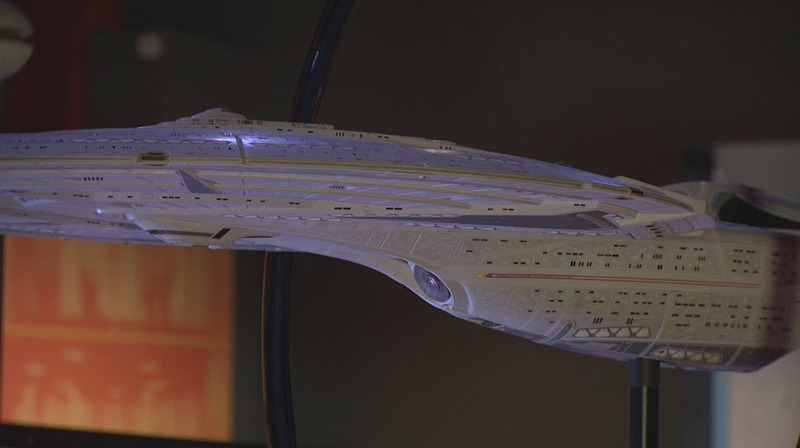 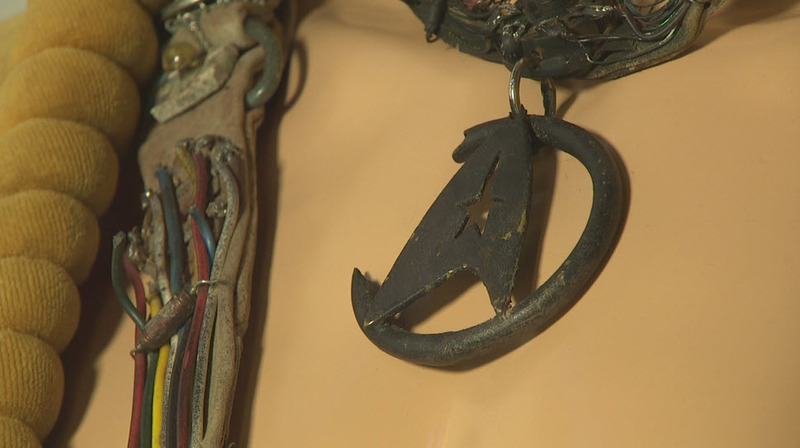 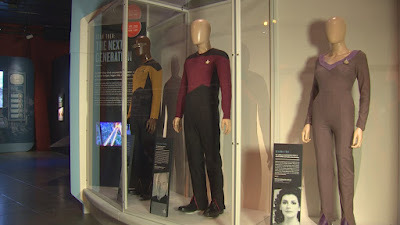 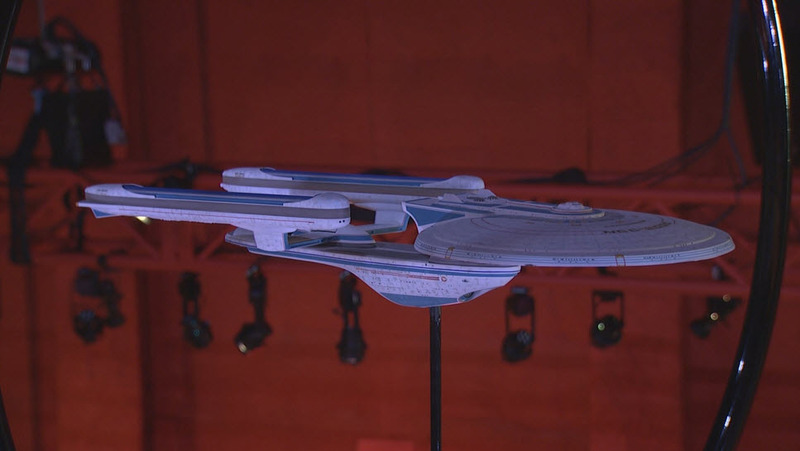 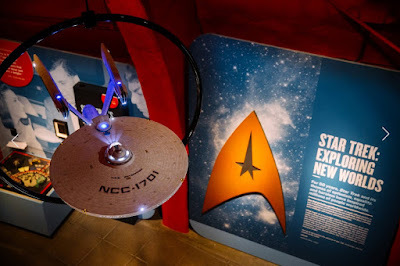 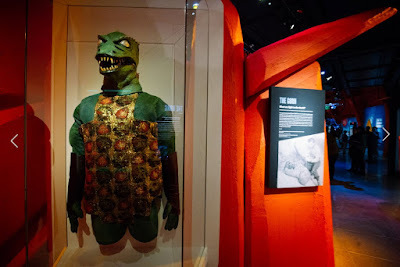 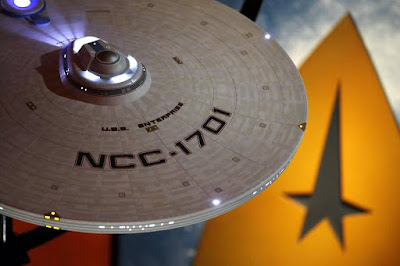 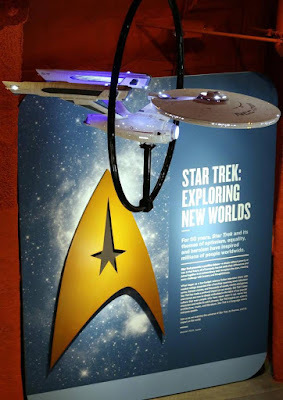 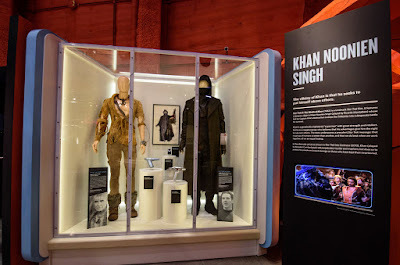 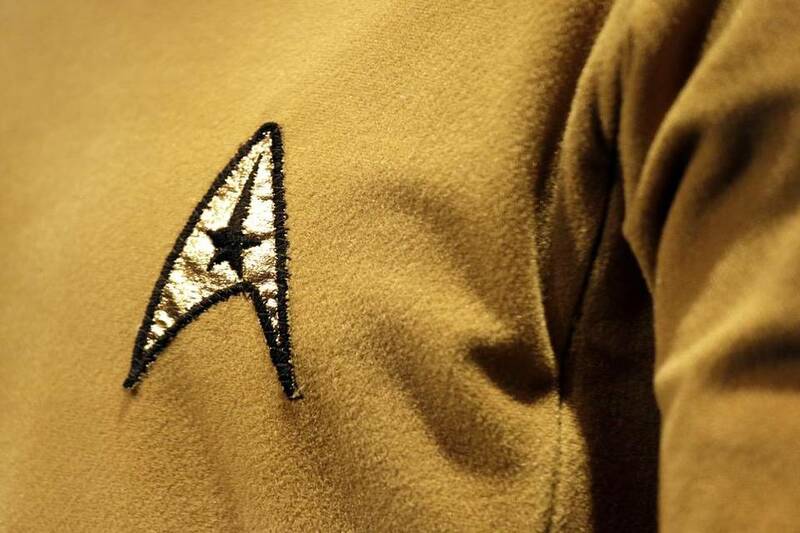 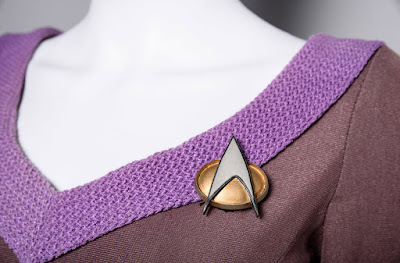 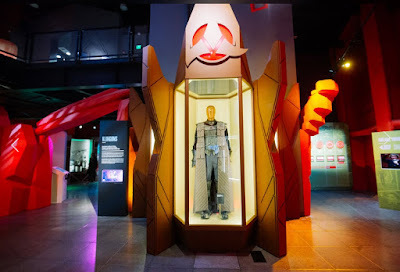 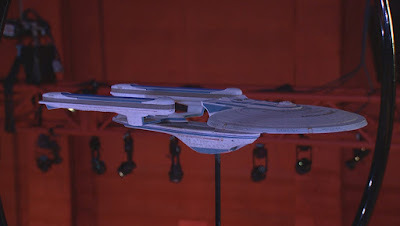 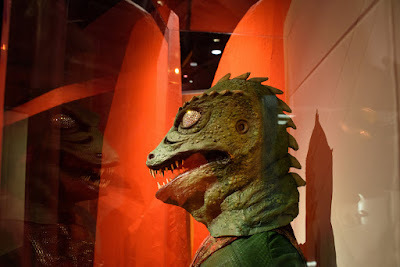 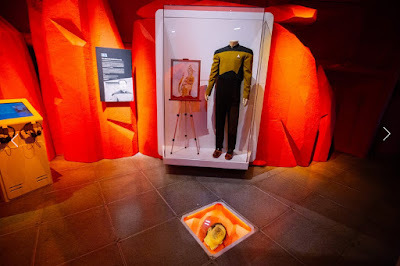 A spectacular exhibition of screen used props, costumes, starship filming models, and set fixtures that is rich in Original Series memorabilia and spans the entire Star Trek franchise - representing perhaps the most impressive collection of Star Trek production artifacts ever assembled for public display - opened its doors yesterday at the EMP Museum in downtown Seattle, Washington. 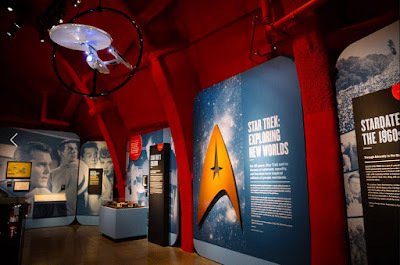 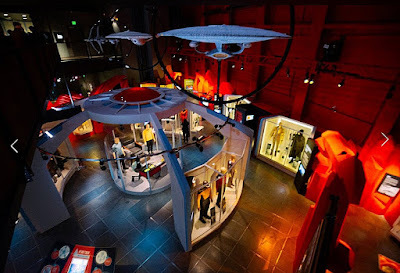 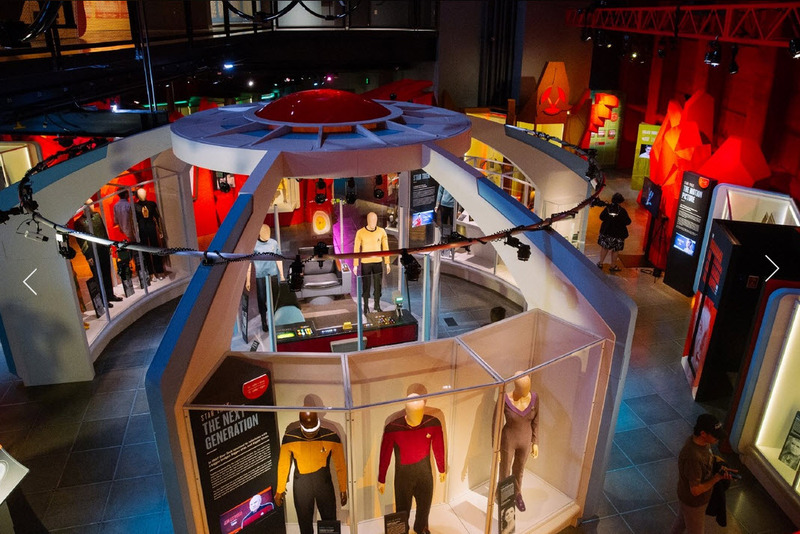 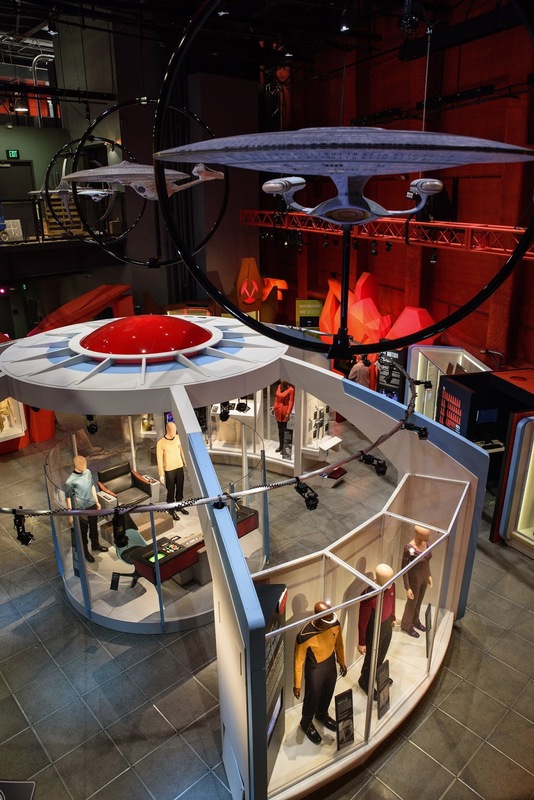 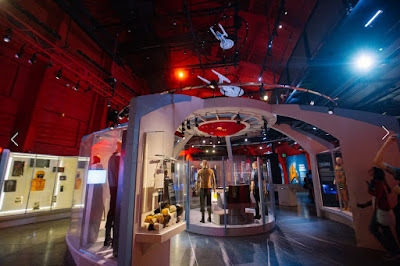 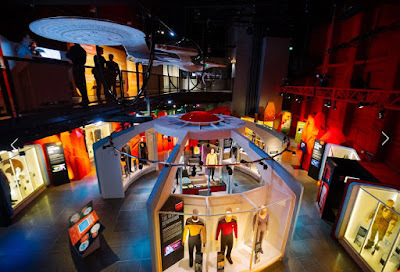 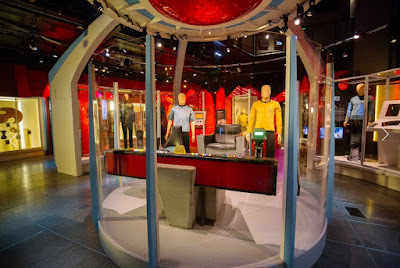 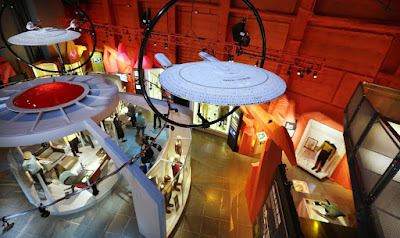 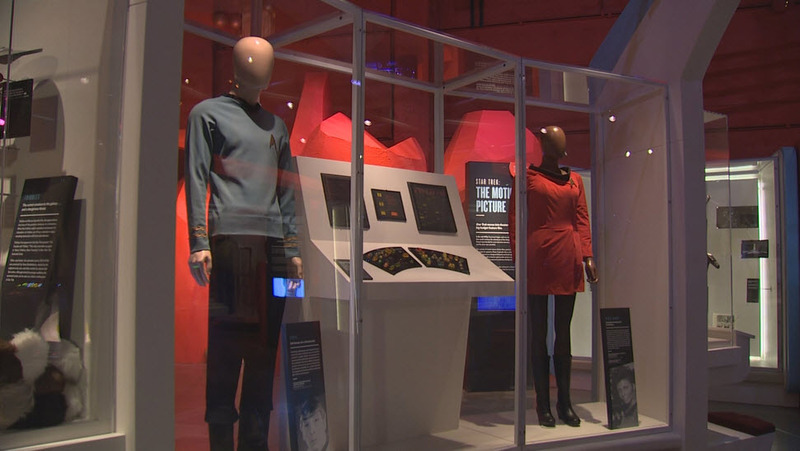 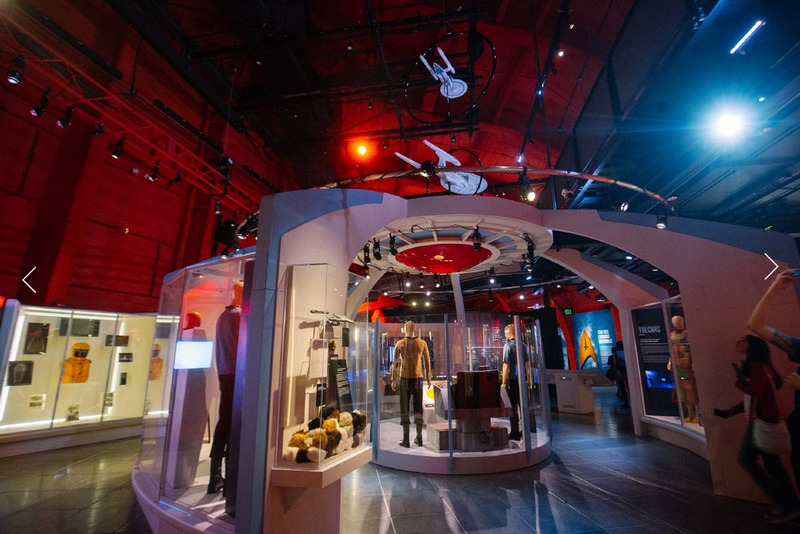 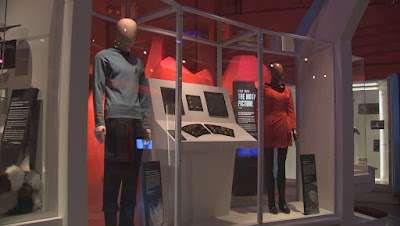 The special exhibit, called "Star Trek: Exploring New Worlds" will run for just over 9 months from May 21st until Feb. 27, 2017 and features more than 100 rare artifacts and high-tech video displays, all presented in a highly appealing labyrinth-like floor layout which is accented by bright orange rock-like pillars and structures that evoke what one might expect to encounter on a TOS landing party exploration mission. 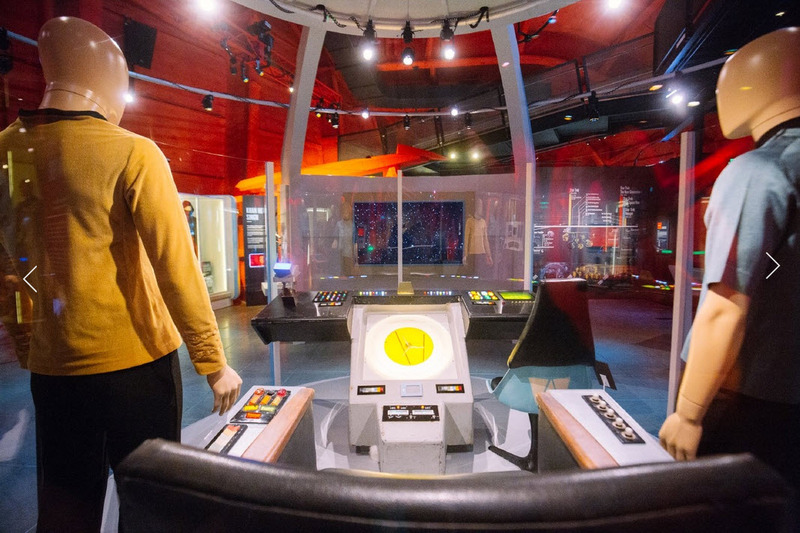 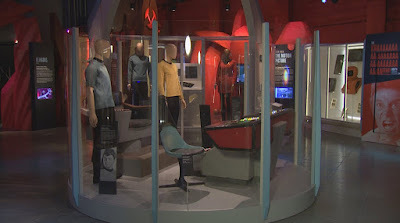 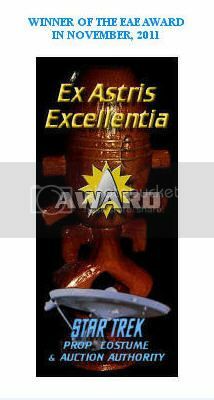 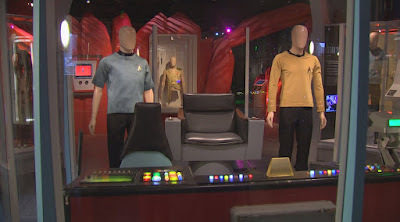 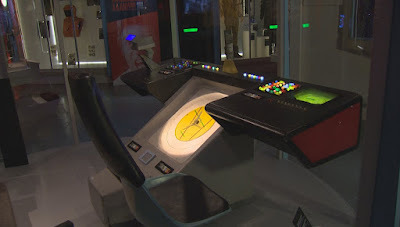 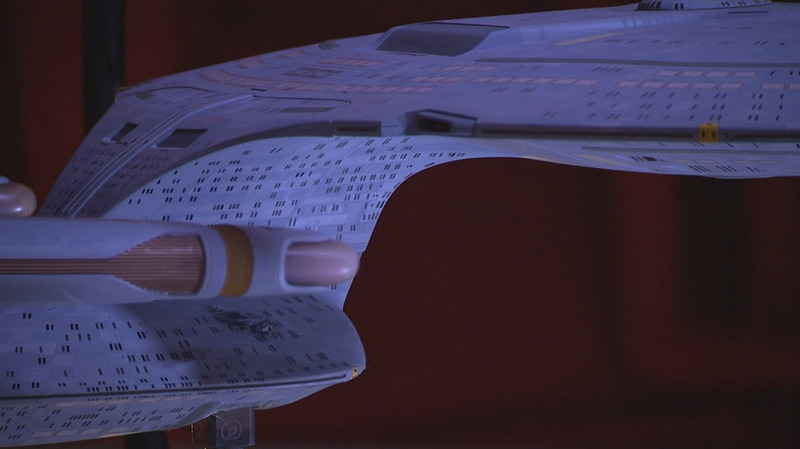 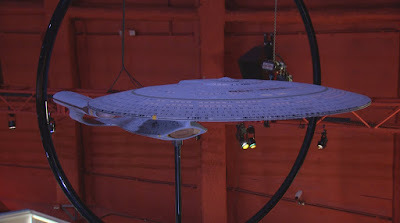 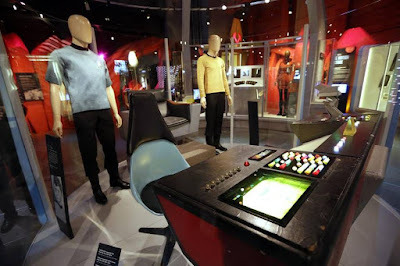 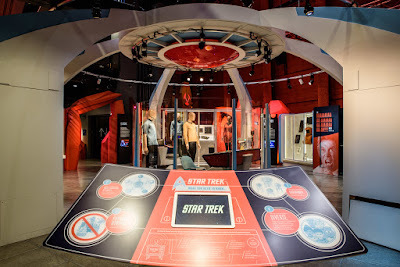 The centerpiece of the exhibit is a stunning display consisting of Captain Kirk's Command Chair and the restored Helm and Navigations Console from the Original Series Desilu Bridge set arranged in the same orientation as they appeared together in all 79 classic TOS episodes, and presented alongside a pair of Starfleet uniforms worn by William Shatner and DeForest Kelley. 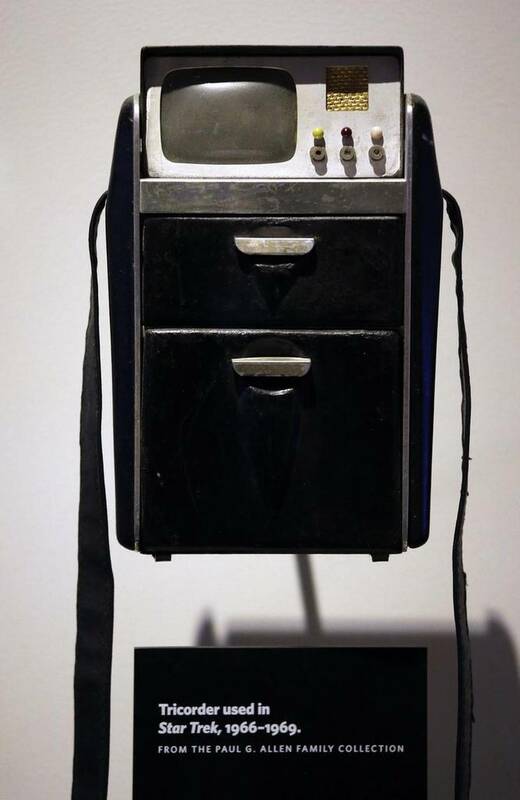 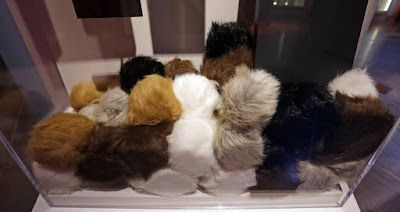 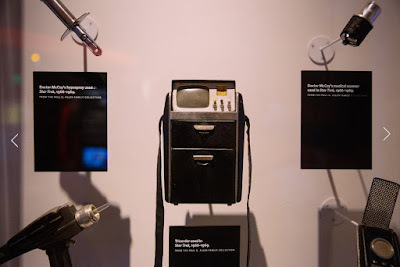 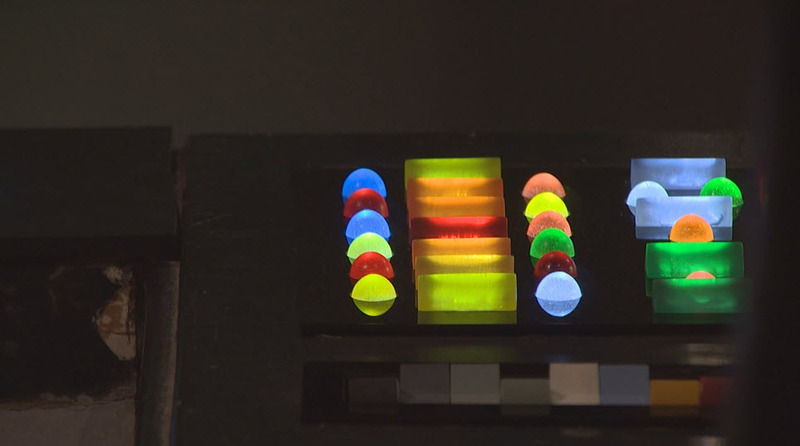 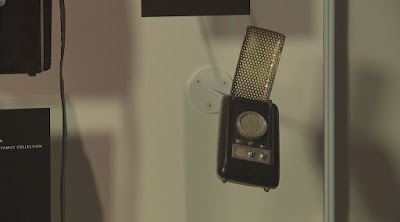 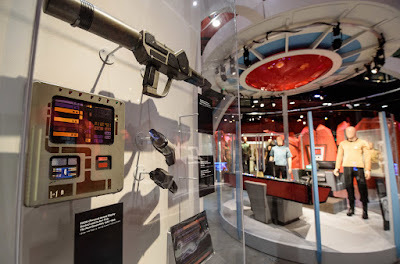 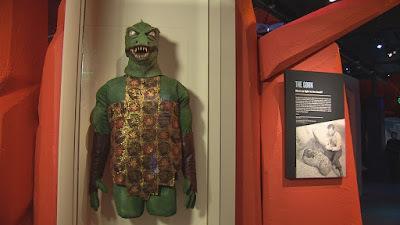 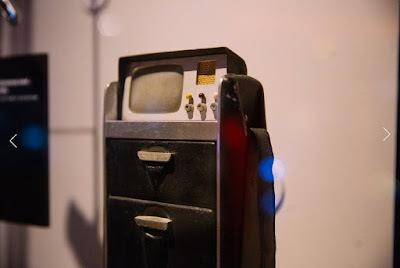 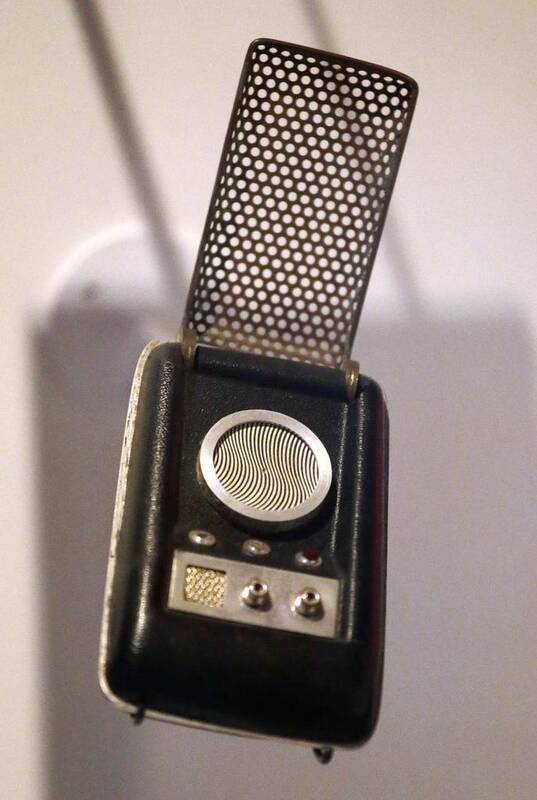 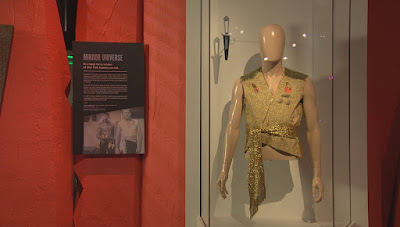 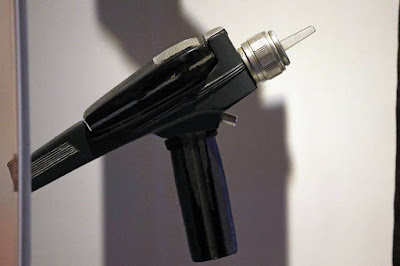 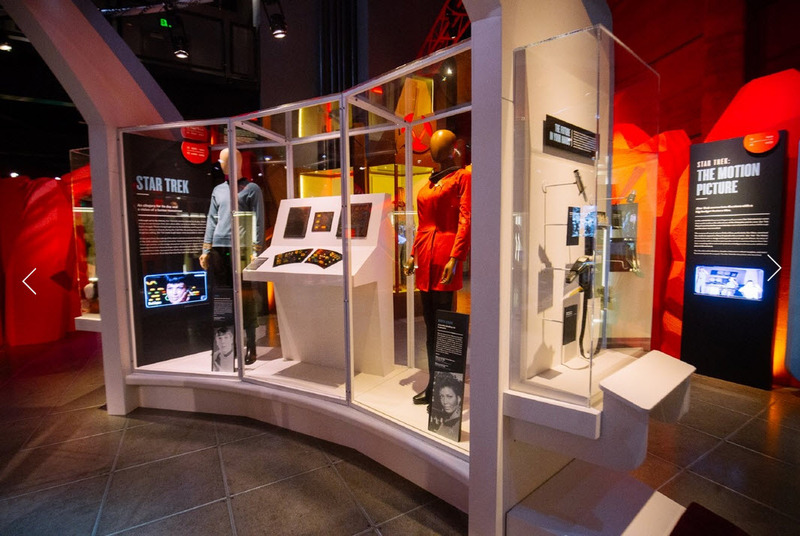 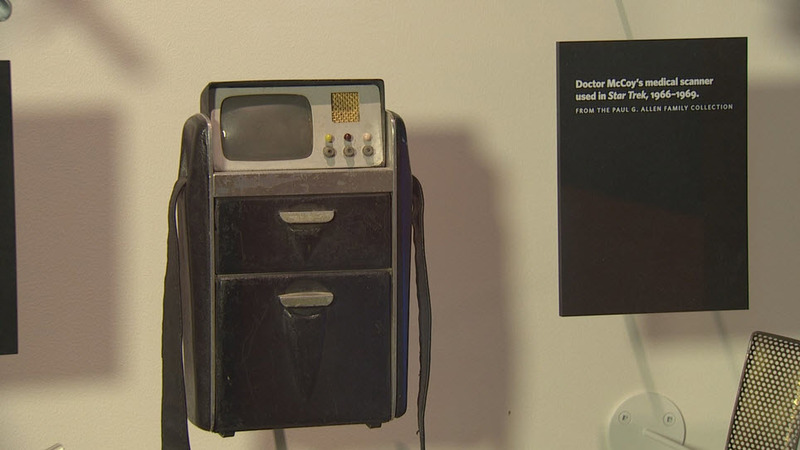 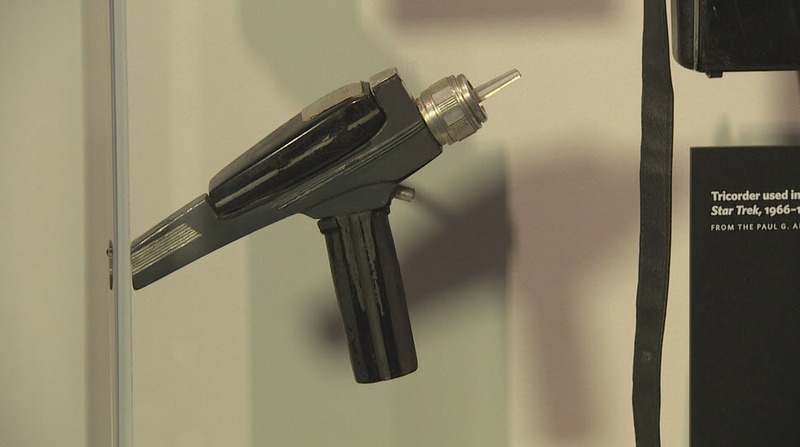 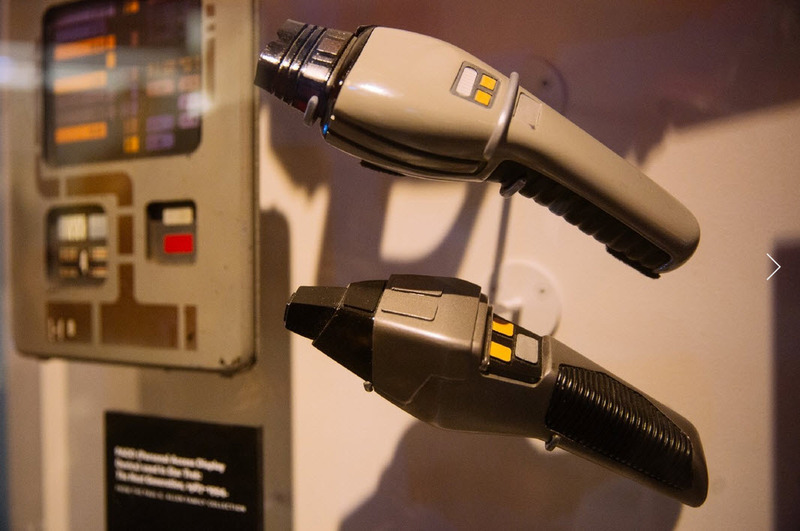 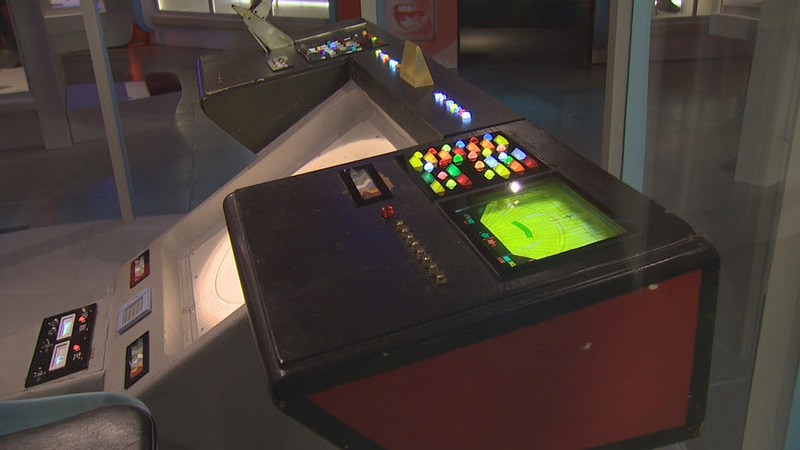 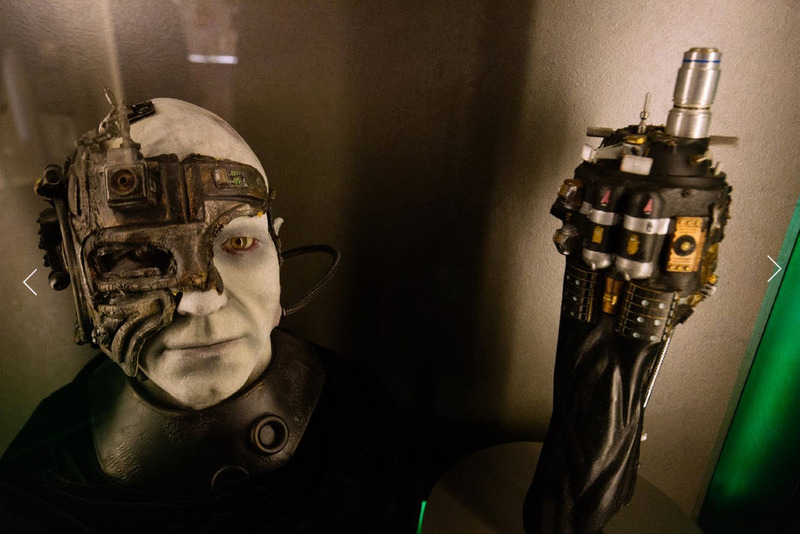 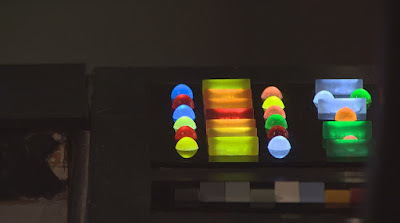 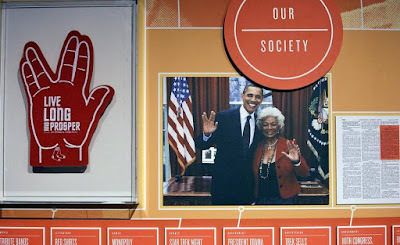 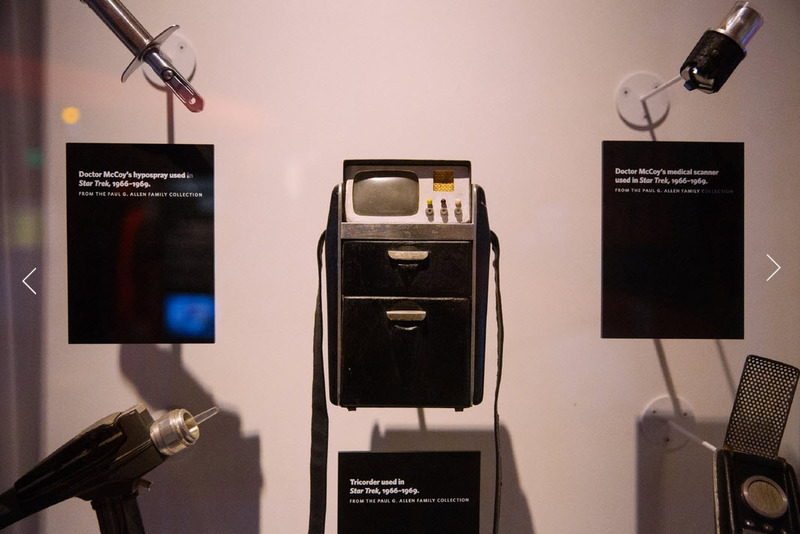 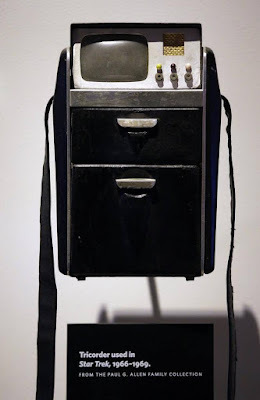 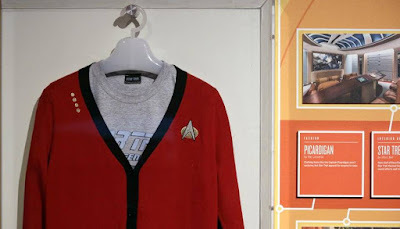 In a nearby display case, the costumes of Leonard Nimoy and Nichelle Nichols are shown with some original TOS Bridge control panels, and an adjacent case presents a group of rare screen used TOS hand props - together on public display as a set for the first time ever - that includes a Tricorder, a Phaser Pistol, a Communicator, a Hypospray, and a Medical Scanner. 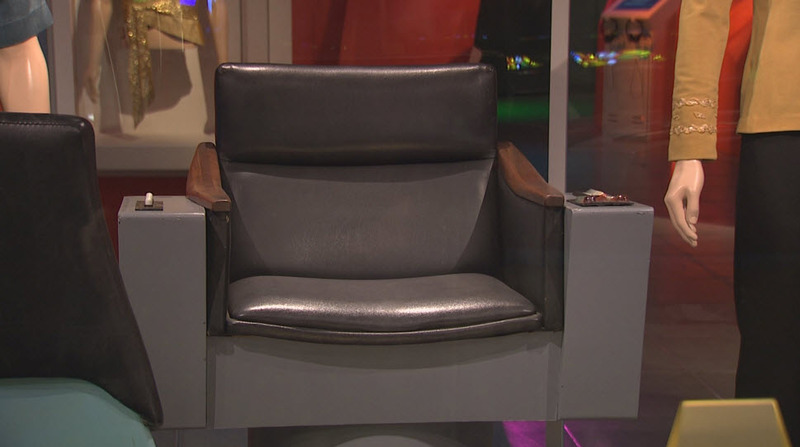 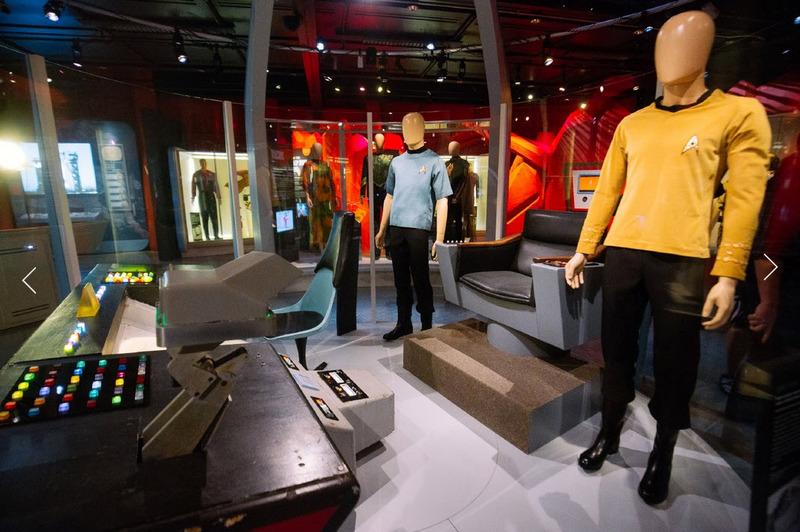 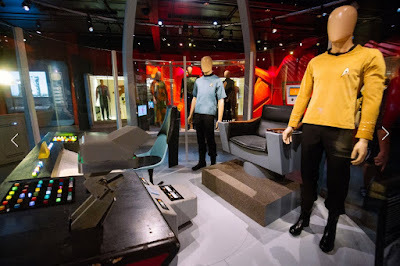 In addition to all of the rare memorabilia on hand, the exhibit even provides several photo-op areas where visitors can pose in a replica of the Original Series Captain's Chair, can record footage of themselves re-creating William Shatner's iconic "Khaaaaaaan!" 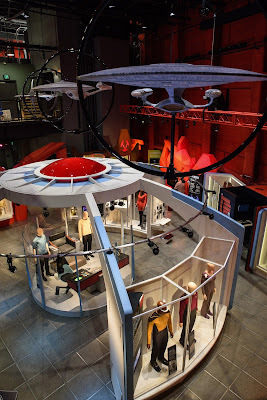 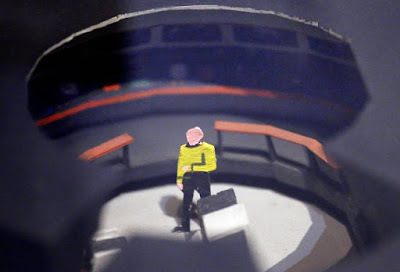 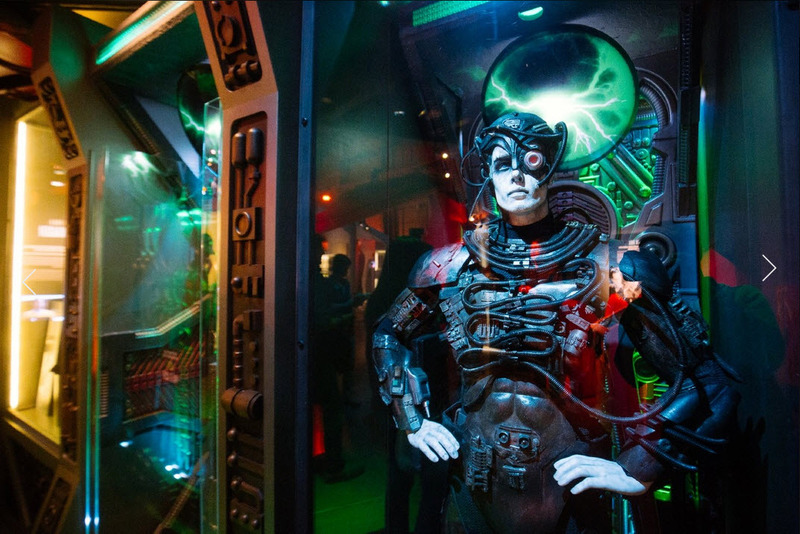 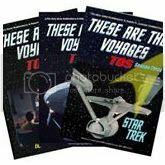 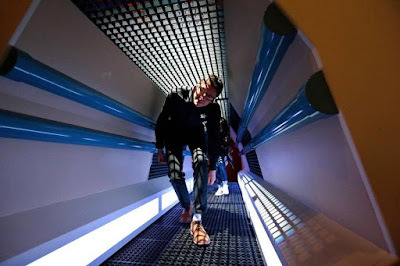 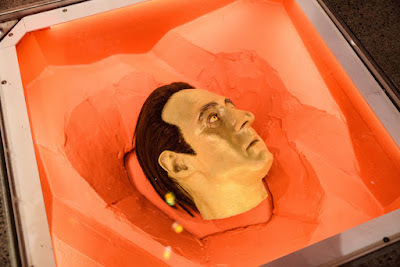 scream in a special booth, or be "beamed up" in a mock Transporter set. And fans can even crawl through a recreation of a Jefferies tube along with many other interactive experiences. Presented below is an extensive collection of photographs that document the exhibit in wonderful detail. These photos were selected from several large online galleries that were published by the websites SeattleRefined.com, SeattleTimes.com (Credit: Brady Harvey), king5.com (for Western Washington's NBC televison station affiliate K5), and bellinghamherald.com (Credit: Elaine Thompson of Associated Press) as part of their coverage of the opening of "Star Trek: Exploring New Worlds". 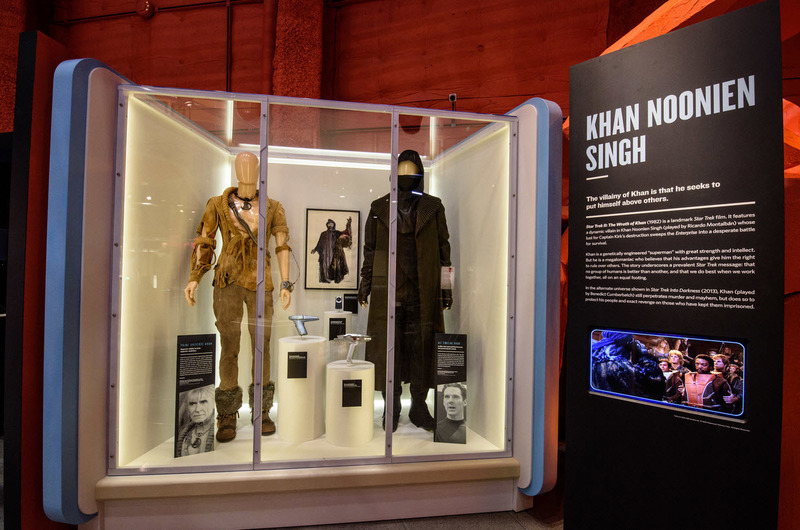 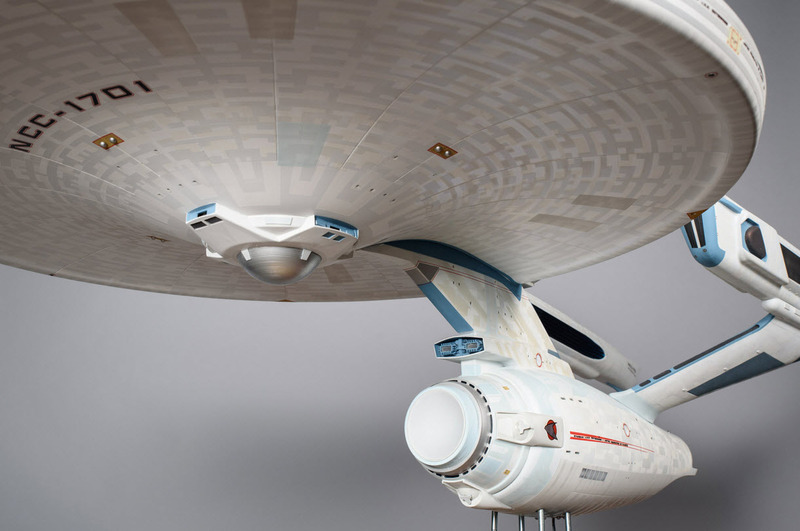 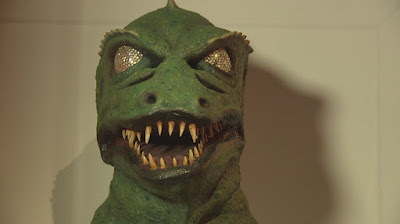 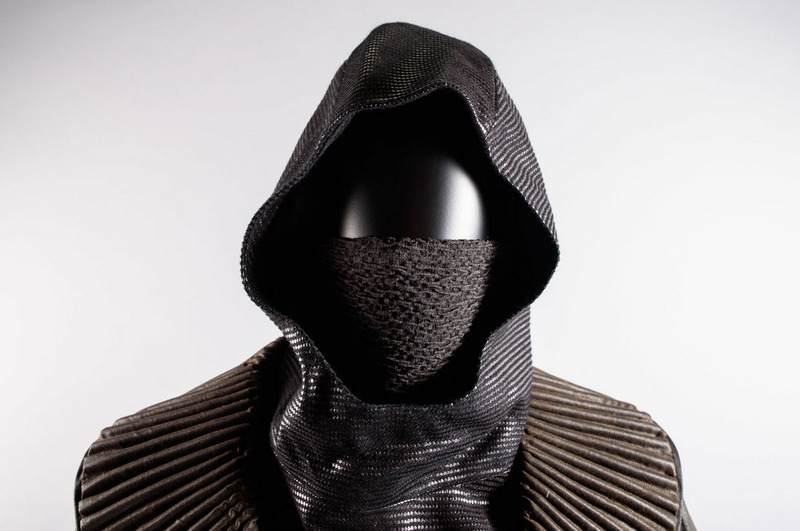 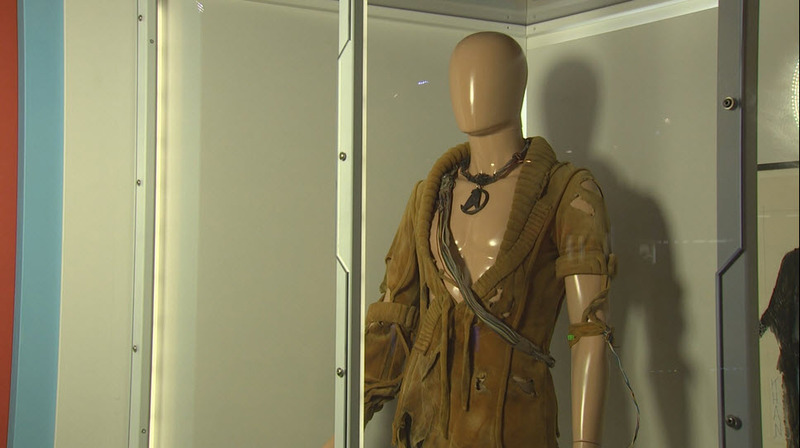 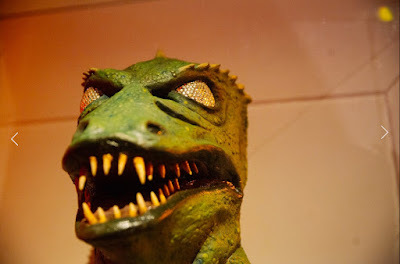 Especially for Original Series fans, this exhibition represents a historic opportunity to personally view some incredible artifacts of the first and finest series in the franchise as they have never been presented together before!